Lost a Microsoft Word password? No problem! Breaking passwords for opening documents and saving changes; three types of attacks (brute-force, attack by an enhanced mask, enhanced dictionary-based attack); flexible, customizable password search options; help through all stages of the search. You can find it all in Accent WORD Password Recovery. 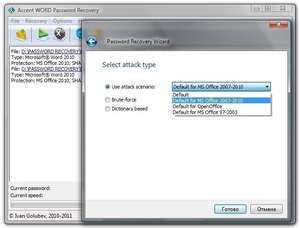 Accent Word Password Recovery 7.93 is a shareware program and can be used as a demo to try the software until the free trial period has ended. A full version of the program is available after the trial period ends. For security reasons, you should also check out the Accent Word Password Recovery download at LO4D.com which includes virus and malware tests. Additional screenshots of this application download may be available, too.